Home / Travel News and Flights Information / Could your Flight be overbooked, legally? Could your Flight be overbooked, legally? Overbooking is a reality to look out for on flights. As more and more people are choosing to book their air travel over the website, there has arisen a fear that airlines are deliberately overbooking places in order to maximise their profits. So for example, if you had a plane that could only hold 250 passengers, then the airline might allow 260-280 people to book places. The unfortunate people whose seats are already taken will be ‘bumped’, or put onto another flight at a later date. This can be annoying to some, who fear that they may miss out on holidays or important deals because they have not been able to arrive on time. An air travel company may decide to overbook a location because they are worried about passengers not showing up, or cancelling their tickets on short notice. However, if they overbook a plane and all the passengers turn up, some will have to be left behind. It is often a legal requirement that airlines have to ask passengers to give up seats in exchange for being ‘bumped’ up to a better class, or getting other forms of compensation. Passengers who are obliged to be ‘bumped’ will also have to have compensation of some kind. 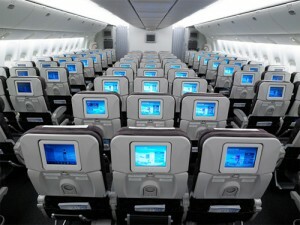 It is not rare for airlines to find customers who are willing to sacrifice their seats on a particular plane for benefits such as being put into business class. These customers can often more worried about the expense of their ticket than when they will be arriving at their destination, and they can often be encouraged to give up their seats for others. Customers are often asked if they would give up a seat when they arrive at the check-in or flight departure boards. They are usually approached by the airline staff, who are aware that the flight has been overbooked and are now looking for customers who will change seats. If you are willing to give up your place on the plane, then you should start by asking a few questions of the crew. Firstly, you should always make sure that you know when the next flight will be available. Some flights to places such as Europe or New Zealand will only leave once a day, so if you give up your seat you may miss out on a day’s holiday. You should also clarify if they are actually offering you a seat, or if you are just being placed on a waiting list. If the latter happens, you could be left waiting for a free seat for several days. Once you are happy with your new seating arrangements, you should then ask the flight staff about compensation. Are they going to provide other benefits, such as an overnight hotel stay, free phone calls, or free meals. This is important, because if you are giving up your seat in order to receive a financial benefit you do not wish to have to sacrifice that cash on rooms, food or car hire. If you are being offered a free ticket, read the terms and conditions carefully. Make sure that you are clear about how long the ticket will be valid for, or if there are certain times of year where the ticket would be invalid (perhaps at Christmas or during the summer). You should also check that you can use your ticket to make a reservation on a new flight, and how long before boarding that ticket can be used. Passengers that are forced to be ‘bumped’ may find that they will also receive compensation, although they may also receive extra gifts in order to make up for the inconvenience. Only those who arrive at their destination in under an hour will not be compensated, although the airline could choose to compensate them if they feel that the passenger is disappointed or upset. If you arrive in over one hour, but in less than two, you may be given compensation up to the cost of a one-way ticket. However, if you arrive more than two hours later, or if the substitute travel is not arranged by the airline, then you may be able to get compensation of around the price of your return ticket. Flights on Qantas have been known to be overbooked. Passengers may be able to obtain compensation known as an involuntary refund for the ticket, but there are several restrictions which can prevent you from obtaining any cash back. To start with, in order to be compensated you will usually have to have a reservation which has been confirmed. If you kept up reconfirmation deadlines, you should be eligible for this. You must also have met the particular airline’s time limit for the ticket purchase, which can rule out a number of discount tickets which have been placed on websites due to lack of sales. You should also have met the check-in deadline, which is often between 10-30 minutes of your departure. Make sure that you know when this deadline is for your particular airline. If you are on an international flight then you will need to go to the checking-in area between 3-4 hours before your flight is due to leave. If you miss this deadline, then you may not be able to claim your seat, and will have lost any compensation for being ‘bumped’. If you are concerned that your flight may have been overbooked, and want to know what to do about it, then you should make the effort to arrive early for your flight. The most likely people to be bumped are those who are last to check in, so getting there early will really help. You may even find that, if you arrive before the previous flight for your destination, then you could be put onto that flight instead. However, there are problems with this, in that if your bag is put on the earlier flight while you are waiting for the later one, your bags could arrive at your destination and be abandoned for some hours. This could cause a problem once you arrive. Even if you are bumped, then your options may not be as difficult as you feared. For example, if you find yourself being obliged to stay near the airport overnight, you could request this as part of a higher compensation settlement from the department. You can also decline the compensation check, and go to court in order to get more compensation. Most people prefer to take the compensation they are offered, and are satisfied with that sum.